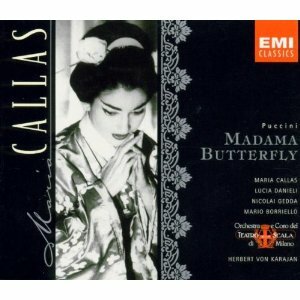 Freni, Scotto, Tebaldi ,Price, de los Angeles ....many are the Butterfly's who in their various ways have broken our hearts, but to me there is none like Callas. The highly charged mature passions of Norma or Tosca or Medea are set aside and what we have here is miraculous presence of a fifteen year old child - a child who through the torment of the betrayal of an unwavering faith grows up... and kills herself. Sweetness, innocence, depth, pathos, tragedy... the revelation of profound human truth... are all present. "Callas' voice seems a vessel which can be filled or drained to various levels of intensity at will. What controlled this flow was the text, for Callas when most moving, sang exactly on the word." recorded in Milan 1955 for EMI Classics - Buy it here!